This review will probably not do enough justice to the quality of this novel. The category may not be everyone's cup of tea, but it still remains a book everyone should read. Swallow your aversion to young adult or romance or whatever would usually keep you from picking up a copy and go for it. I promise it will be worth it. If you are familiar with the author, then you are already aware of her style. She is the creator of the Sisterhood of the Travelling Pants series, most notably. However, this latest novel is a fresh side to the young-adult-falling-in-love-for-the-first-time theme. I have to admit I really could have gone without this plot device. It wasn't as well developed as her previous stories, though it was an incredibly real ending. Falling in love for the first time is great, but there are more important lessons to learn. 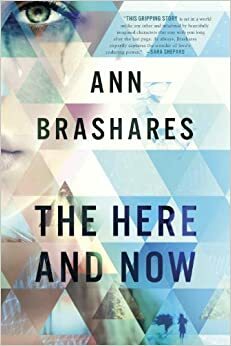 Ann shows those lessons for the here and now (hehe, title pun) with gritty realness. The characters themselves were well developed with back-story and growth in a short 246 pages. The interactions between all the lead and supporting characters is a bit weak. We get plenty of action between the two lovebirds, but there are so many other dramatic, plot-essential characters. It is a bit of a shame they all don't fit quite right together. Now for the amazing plot. Where should I slate this novel? Dystopian, pandemic, teen romance. Sure, that will work. You have the young, naive teenager who starts to realize that her life has been jaded by the superiors meant to take care of her. She falls in love with the boy who has been forbidden by the community rules. Now that all seems cliche and tiresome, but I promise this book has so much more underneath. The actual material behind their exile is just so relevant to our very own time. The overall message this book spreads is fundamentally essential. This is a YA novel, so don't expect to be stumped by the conclusion or have a hard to solve mystery in front of you. I certainly didn't know all the finer details by the end, but I had a 3/4 done puzzle by the half way point. The entire beauty of the story rests solely on what you take away from the pandemic. I easily read this book during my weekend break with errands and poodle exercising in between. This book gets 4 stars for sheer importance of the plot (to me). It is a fast enough read you really have no excuse not to attempt the read to broaden your mind (once again, even if it is outside your comfort genre). Learn a life lesson. Pick up a copy TODAY!